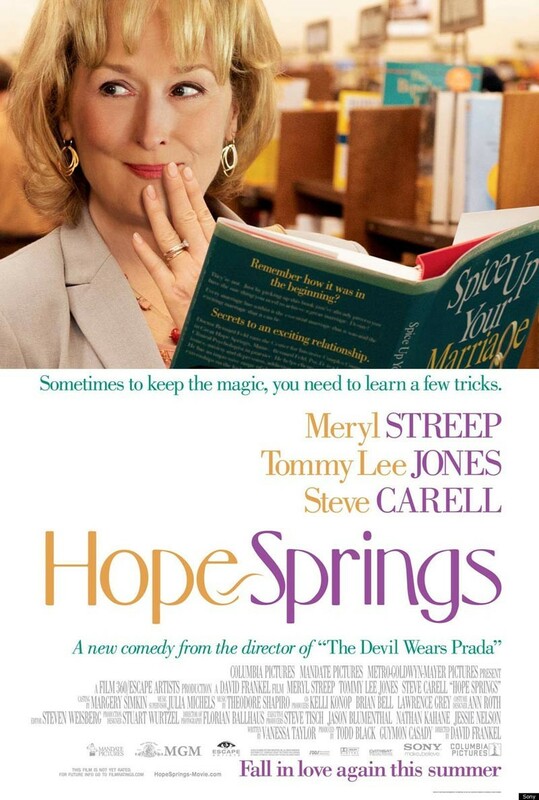 I’m highly reluctant to describe HOPE SPRINGS as a “romantic comedy” because it’s nowhere near as brain dead as 90% of the movies in that genre. HOPE SPRINGS is too smart for that. I suppose the best label that can be slapped on it is “dramedy” as it’s got too much drama to be a flat-out comedy but yet it’s got more than its share of lighter moments to be classified as a straight-up drama. But whatever you do, don’t be taken in by the trailers which makes this movie out to be a wacky laugh riot with Meryl Streep, Tommy Lee Jones and Steve Carell trading funny lines. HOPE SPRINGS is most definitely not that kind of movie. Kay (Meryl Streep) and Arnold (Tommy Lee Jones) have been married for thirty-one years. They apparently have an affluent life-style and have raised good children. He works hard at his job and she keeps a good home. But for Kay it’s not enough. There’s an emotional disconnect between herself and her husband she doesn’t know how to fix. Fortunately she runs across a book written by Dr. Feld (Steve Carell) who is a specialist in couples counseling. Desperate to reignite the long dead flames of passion in their marriage, Kay persuades Arnold to attend a weeklong counseling session in the small Maine town of Hope Springs where Dr. Feld lives and works. It isn’t going to be easy. Arnold doesn’t see the need for counseling and even though at first Kay is all for it, there are some long buried feelings inside her that get poked and she’s not entirely comfortable with that. There are some deep emotional and sexual issues in conflict here and it’s going to take a maximum effort from Arnold and Kay to get this marriage back to where it once was. But can they? Do they even want to? This is very much a relationship movie targeted at an older audience. Not that younger movie fans of Meryl Streep and Tommy Lee Jones can’t go see this and won’t get something out of the struggles of their characters as they re-learn how to love each other in ways that are sometimes heartbreaking, sometimes sad, sometimes funny and occasionally downright hilarious. Saying that Meryl Streep and Tommy Lee Jones are extraordinary actors is as unnecessary as saying water is wet. And you would think that this kind of role is one that Meryl Streep could play with her eyes closed but as usual she makes whatever she does on camera look as fresh as if she’s making it up as she goes along. As for Tommy Lee Jones, he’s one of those very few actors who are funniest when they’re not trying to be funny. Some of the best laughs he gets are when he’s delivering his lines with an absolute straight face and deadly seriousness. He trusts that the situation and the reaction from his co-stars will sell the lines and it does. Steve Carell’s role as Dr. Feld is the most surprising one in the movie and I’ll leave it for you to discover how if you choose to see this movie. He’s really interesting in how he quietly stays back and doesn’t try to steal scenes from the two old pros. Watch what he does in this movie and I think you’ll agree with me that it’s some of his best work so far. I can’t stand him in “The Office” but I don’t think there’s a movie Steve Carell has been in I’ve seen I didn’t thoroughly enjoy his performance. There’s some solid work from Jean Smart, Mimi Rogers and Elisabeth Shue in roles that are actually extended cameos. But they use their time wisely like the talented actresses they are and it’s always welcome to see them in a movie. So should you see HOPE SPRINGS? If you’ve been lamenting that movies now are all about superheroes and special effects this is most definitely the movie for you. There’s nothing here except for a mature story about rebuilding a marriage, the usual wonderful acting from Meryl Streep and Tommy Lee Jones, a surprisingly different performance from Steve Carell and solid support from Jean Smart, Mimi Rogers and Elisabeth Shue. Combine that with beautiful photography and locations and you’ve got the perfect date movie for married couples. Enjoy.